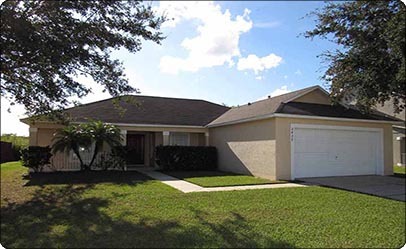 Crescent Lakes community is located approximatley 10 miles from Hwy 192 and I4. The community covers miles of paved sidewalks, lakes, a tennis court, a basketball court and two childrens playgrounds. The front entrance leads into the kitchen complete with all necessary utensils, appliances and a 6 seater dining table. Breakfast bar separates the kitchen from the family room which enjoys flat screen TV, Netflix, internet access and overlooks the south facing pool and lake to the rear of the home. Off the family room is the en-suite master bedroom complete with a Queen size bed, flat screen TV and patio doors leading to the pool area. Also off the family room is a second bathroom and two further bedrooms. The swimming pool, which is accessed through the family room, 2nd bathroom and master bedroom is south facing and enjoys a lake view. Both sides of the property has a wooden fence for additional privacy.